Is it collaboration when you’re sent the yearly performance review spreadsheet and instructed to assess your staff’s performance? Absolutely not; it’s an act of co-ordination. Everyone is working separately to achieve the overall goal of conducting the performance reviews. Only a modicum of trust is required (trust in the system) to get the job done. So what is collaboration then? It’s when a group of people come together, driven by mutual self–interest, to constructively explore new possibilities and create something that they couldn’t do on their own. Imagine you’re absolutely passionate about the role that performance reviews play in company effectiveness. You team up with two colleagues to re-conceptualise how performance reviews should be done for maximum impact. You trust each other implicitly and share all your good ideas in the effort to create an outstanding result. You and your colleagues share the recognition and praise equally for the innovative work. The important factor is mutual self-interest. When people create things they really want to create, and it is also good for the company, it energises and engages people like nothing else. Just ask Google, who have institutionalised collaboration by giving every engineer 20 per cent of their work week to spend on any project that takes their fancy. Today most commentators conflate co-ordination, co-operation and collaboration under the single banner of ‘collaboration’. All three types of working together are important, but creating environments where collaboration (as we have defined it) happens creates a spark that will truly transform an organisation. The important skill is knowing when to collaborate, co-operate and co-ordinate. When is the best time to collaborate? Simple: this is when there is a clear relationship between cause and effect. When you do X you always get Y, and no matter how many times you do X you get the same Y result. Organising the performance reviews is a good example. You can predict with confidence the end result of the activity. In these cases co-ordination can be used to great effect. Complicated: this is when there is still a relationship between cause and effect but you have to put effort in working out that relationship and there is often a range of possible answers. This is the realm of experts who put in the effort working out these cause-and-effect relationships. Co-operation is effective in this domain because there is often a clear end goal in mind but you need the combined forces of a range of people to achieve it. Complex: this domain is characterised by causes and effects that are so intertwined and intricate that things only make sense in hindsight. You hear people saying: “Ah, the reason that happened was because …”, but if you rewind the tape of what just happened and play it again, you get a different outcome; rewind and play again, and yet another outcome. This phenomenon occurs because in complex situations everything is so interconnected that a small change in one part of the system can have inordinate impact somewhere else, and vice versa. The system is unpredictable in detail, yet we can discern patterns. Designing and implementing a new performance management approach is complex because, regardless of how much analysis we do before putting it into practice, we won’t know how it’s going to work in detail. It is in these complex situations that collaboration comes to the fore. The last domain of the Cynefin framework is chaos. This is where it’s impossible to discern a relationship between cause and effect. The best approach in this domain is simply to take action. 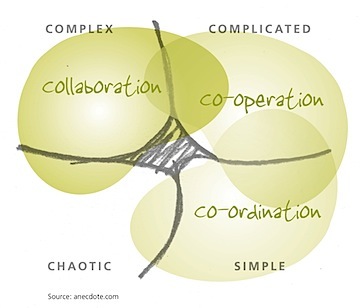 Paradoxically it really doesn’t matter which group style is used here, as any way of working will either create opportunities in the complex space where collaboration can take effect, or push the situation into the simple domain where a co-ordination approach is effective. With the Cynefin framework as a guide, we can better align the type of group work with the nature of the issue at hand. Collaboration is not the best approach in every situation and let’s not fall into the trap of thinking of it as a panacea. Sometimes it’s simply more effective to issue a direction to get the job done when the job is simple or complicated. It’s when things are truly complex that collaboration is most effective, and the reality is that the world is becoming more connected, faster moving and therefore more complex by the minute. Collaboration will have a growing role to play in every organisation. Economist Intelligence Unit (2008). The role of trust in business collaboration. Snowden, D. J. and M. E. Boone (2007). “A Leader’s Framework for Decision Making.” Harvard Business Review November. It dawned on me today that a lot of our knowledge-related activities reflect, depend upon or contribute to things beginning with ‘C’. In that spirit, today’s post is brought to you by the letter C and the number 7. Great post – lots of overlap in thinking with a piece I wrote in 2007 on Cooperation vs. Collaboration. Look forward to reading some of your other posts on this.